The birth or adoption of a child is a special time for families. We’re with you and your child starting from when you choose their special name. Issuing Social Security cards to newborns makes us the source for the most popular baby names each year! The top names of 2016 were Noah and Emma. We reveal the top 10 names for boys and girls every year. Visit our baby names page to see popular names from the past 100 years! You can also share it with friends and family members who may be expecting a child or grandchild. Maybe they’ll find a name on our list that they love, thanks to you! 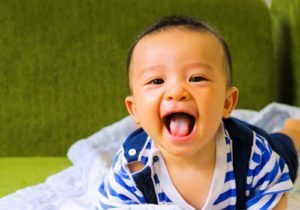 After your child has a name, the second thing they’ll need is a Social Security number; we’ll issue a unique one soon after birth. They’ll need their number throughout many important stages in their life, beginning with when you claim them on your tax return. It’ll also be useful if you need to apply for benefits for your child. We offer a wide range of resources for families with children. And, when the time comes for their first job, their number is already in place. This entry was posted in Special Events and tagged 2016 baby names, baby, baby names, social security baby names, Social Security Number, SSN by Jim Borland, Acting Deputy Commissioner for Communications. Bookmark the permalink. Article is titled 3 things to do… I only find two… name and SSN … what’s the third?! Thanks for reading our blog! The first thing you need to do is pick a name for your baby. Visit our Popular Baby Names webpage to help you decide on a special name for your baby. We get it, name the child and get a SSN that is the other thing? Or is there only 2 things to do and this was sloppy proof reading? weak article. basically, you pick a name for baby, and get an ssn. pretty obvious you need a name for the baby!! and getting the ssn is automatic normally through the hospital. and what’s the 3rd thing???? you list name and ssn, don’t state a 3rd thing as suggested in the article’s heading. The article is titled “Three things every parent should do” but one is automated and the last step isn’t clearly outlined. The article is misleading as it only names two things which in fact are so obvious and most states are enumeration at birth so this isn’t really a steps for 99% of the population. The last step, if any isn’t even reflected or clearly outlined in the article. The Social Security Trust funds are established in Sec. 201 of the Social Security Act under 42USC§401. They are sustained by the Federal Insurance Contributions Act (FICA) to ensure that an appropriate amount of tax dollars are transferred from the General Fund to the Social Security Trust Funds under 26USC§3121. Aside from effectively treating the intellectually disabling effects of calculus upon the arteries, the most important substantive social security issue in the United States pertains to the law regarding the cost-of-living adjustment (COLA) under Sec. 215(i) of the Social Security Act under 42USC§415(i). COLA has been neglected since the hyperinflation of the early 1970s and religiously abused as an OASDI tax rate calculus substitute since 2009. COLA must be re-interpreted to guarantee lower-income by law social security and other welfare program beneficiaries a 3% COLA to stay ahead of average 2.7% consumer-price-index (CPI) annually adjusted rate of inflation since 1980, provided the combined OASDI trust fund has a trust fund ratio greater than 20%, to comply with the Iron Law of Wages for high rates of catch-up economic growth to escape the inflation of printing Engel’s Law. Neither nation nor labor budget can afford to irregularly pay reparations for the resulting attrition of purchasing power. This attrition dangerously impoverishes and depletes the savings of lower income Americans. Lower-income social security and other welfare beneficiaries who do not have the patience to find rental expenses less than 30% of income, destitute at the end of the month. Lower-income workers, especially those with expensive children who need to legislate an automatic 3% annual increase in federal minimum wage under 29USC§206(a)(1)(D) and unemployment compensation contributions to ensure all 4 million women giving birth to United States citizens are equally paid maternity leave for 14 weeks maternity protection under ILO Convention 183 (2000) to reduce alarmingly high rates of legitimate demand by an industrialized nation for Supplemental Security Income (SSI) under Sullivan v. Zebley (1990) T with the payment of Temporary Assistance for Needy Families (TANF) under Sec. 404 of Title IV of the Social Security Act 42USC§604 and Supplemental Security Income (SSI) Program for the Aged, Blind and Disabled under Sec. 1611 of Title XVI of the Social Security Act 42USC§1382. There are three decisions that Social Security Administration (SSA) needs to make now, for fiscal and calendar year 2018. Hopefully in the first combined Annual Report on the OASDI and SSI Trust Funds. First, resolve to pay the high cost DI estimate to afford all social security beneficiaries their 3% COLA (or 2.7% 2018 and 3% every year thereafter to equal $777 SSI in 2019) and ensure working age contributing orphans and insulin dependent diabetes mellitus patients (IDDM) are qualified disabilities for a compassionate allowance. Second, compensate the DI Trust with 2.5% asset accumulation plus interest, for not being able to perform the OASDI tax rate calculation in a timely fashion 2009-2015, for an interest adjusted estimate of $240.4 billion transfer from OASI to DI in 2018. Third, create a Supplemental Security Income (SSI) trust fund to distribute the tax on the rich to end poverty by 2020 with a full SSI benefit, beginning with all 16-24 million children growing up in poverty in 2018. The Board of Trustees is morally bankrupt only because of Social Security Matters censorship of the balanced federal budget. The SSA Actuary must recuse the Labor and Health Secretaries to have any hope of producing any sort of Annual Report without any of the physical violence and terrorism by Republican murder strongholds on the Treasury that Social Security Matters covers-up with their censorship of the actual laws governing the United States, especially during the split ticket stage of parliamentary incompetence so easily cured by an email to the author of the 7th stage. SSA has a fiscal year 2017 duty to produce both an Annual Report on the SSI Program and the First Annual Three Year Budget Request of the Social Security Administration. OMB, quit the cut and paste nonsense. Half of it is out of context and most of it is of the topic drivel. Keep it up and you’ll be blocked. Three things…..Pick a name, wait for a SSN, and learn about the child’s benefits. Thank you, Mr. Borland. Nice post.